Each year has its memorable meals, but this one brought an embarrassment of riches. 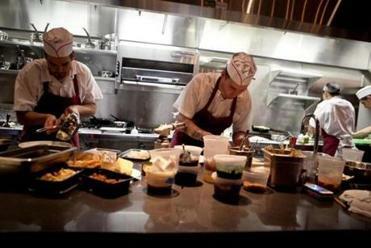 So many fine restaurants debuted in the Boston area; so many stalwarts demonstrated why they keep customers coming in. This makes it harder than ever to narrow down a list of highlights. Additions keep rolling in, from restaurants so new they haven’t yet been reviewed: Fairsted Kitchen’s lamb ribs with spicy vinegar fish sauce and Sarma’s pumpkin fritters, just to name two. Here are some of the many dishes that stood out, everything from simple, well-made salads to cleverly reimagined classics: 13 dishes I was thankful for in 2013. What could be better than playing Donkey Kong and drinking Lambrusco in a tiny bar that looks like a hipster’s basement? Eating really great pizza while doing so. Somerville’s A4 Pizza makes this possible. Dough is made from a starter that’s more than a decade old, blasted in the wood-fired oven after a long fermentation period. My favorite pie was topped with mushrooms, gremolata, and egg. 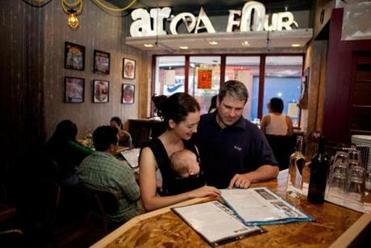 445 Somerville Ave., Union Square, Somerville, 617-764-4190, www.areafour.com. Among many great restaurants that opened this year, Asta was a highlight, passionate, fun, and delicious. Chef Alex Crabb serves nothing but tasting menus at his Back Bay spot; one night the five-course version presented scallops in an entirely new way. Crabb sliced into the round, unfurling it like a roll of tape. He served it seared, with pickled blueberries and farro cooked in beet juice and beer. The dish tasted as striking as it looked. 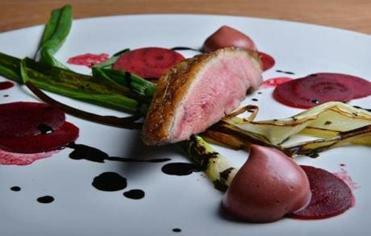 Pictured, duck breast with beets and scallions. 47 Massachusetts Ave., Back Bay, Boston, 617-585-9575, www.astaboston.com. T.W. Food chef Tim Wiechmann takes a new direction with second restaurant Bronwyn, serving dishes from Germany and Central Europe — schnitzel, sauerbraten, spatzle. He makes sausages to swoon for. I loved the warmly spiced currywurst and the weisswurst, bright with lemon. Perfect with a giant pretzel and a mug of German beer. 255 Washington St., Union Square, Somerville, 617-776-9900, www.bronwynrestaurant.com. Cafe Sushi looks like your average sushi spot, dishing up California rolls and teriyaki. 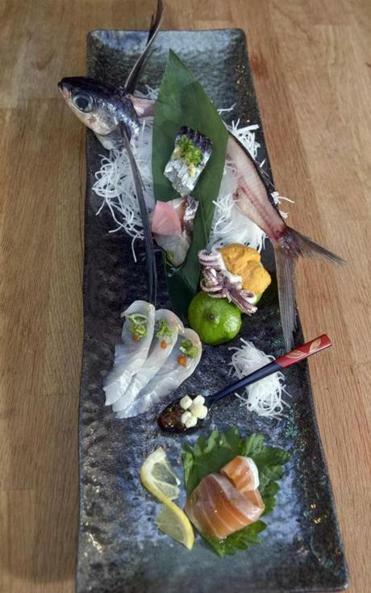 It can serve that purpose, but it’s so much more, as you find out when you sit at the bar and order “omakase.” This means “I leave it up to you.” Chef Seizi Imura and crew create exquisite bite after exquisite bite. Highlights of a recent meal included glorious tea-smoked salmon from Machias, Maine, and squid tentacles with pickled cucumbers, topped by a fried whiting head. Imura knows when to pile on and when to pull back: One of the most satisfying courses was a quiet, palate-cleansing cup of broth made from sea bream bones. 1105 Massachusetts Ave., Harvard Square, Cambridge, 617-492-0434, www.cafesushicambridge.com. 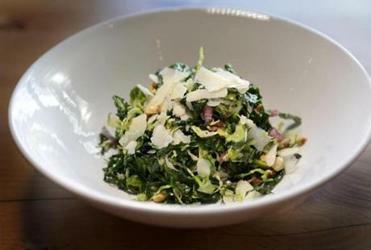 Who would have predicted raw kale salad would become ubiquitous on restaurant menus? The version at Cook, a neighborhoody Newtonville restaurant from chef Paul Turano (Tryst), is particularly good. Kale and Brussels sprouts are sliced thin, tossed with hazelnuts, Parmesan cheese, and verjus, pressed from unripened grapes. The result is wonderfully balanced, tart and earthy and rich. Kale salad (picutred) may be everywhere, but you’ll be back for this one. 825 Washington St., Newtonville, 617-964-2665, www.cooknewton.com. 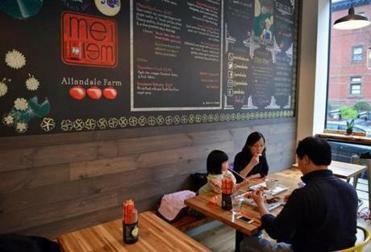 Gene’s Chinese Flatbread Cafe is the second branch of a Chelmsford restaurant with a cult following. Chef-owner Gene Wu serves dishes from his native Xi’an — namely hand-pulled noodles, thick, chewy, rustic hanks that come topped with either chile oil, cilantro, and raw garlic or cumin-laced lamb. They are truly excellent, best eaten immediately in the small, no-frills restaurant where Wu stretches and slaps them into shape. 86 Bedford St., Downtown Crossing, Boston, 617-482-1888, www.genescafe.com. This year, Grill 23 turns 30. The restaurant looks a bit worn at the edges, but the steaks are aging very well. To wit, an 18-ounce rib-eye aged (pictured) for 100 days. 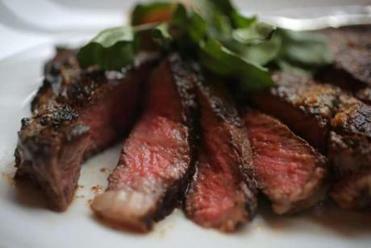 It is tender with deep, rich flavor, and the kitchen cooks it properly to order. The crust is crisp and just thick enough, sprinkled with plenty of salt. It’s the finest steak I ate all year. 161 Berkeley St., Boston, 617-542-2255, www.grill23.com. No more standing in line, slurping late at night, or clicking for tickets to a pop-up restaurant: Good ramen is easier than ever to find. 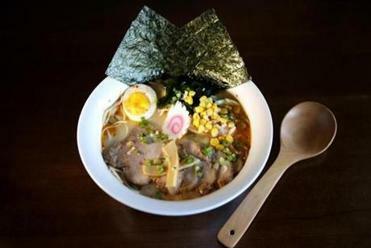 Inaka is one of the newest and best bets in town for a bowl of the Japanese noodle soup. There are several variations, but it’s the spicy miso that won me over, with its rich, savory, warming broth. 72 Brighton Ave., Allston, 617-562-1668. 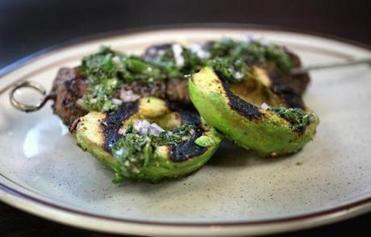 Many dishes stand out at The Kirkland Tap & Trotter, the new restaurant from Craigie on Main chef Tony Maws: a giant, juicy pork chop; skewered steak tips with grilled avocado (pictured); house-made spaghetti with pumpkin, brown butter, and chicken liver I’d be happy to eat once a week. But the most compelling might be the grilled salmon head, the meat lush beneath crisp, charred skin, making the most of what some might consider scraps. Waste not, want. 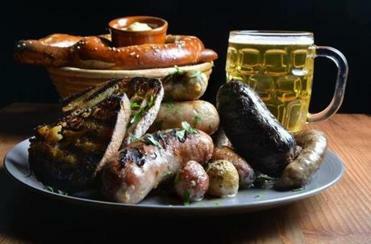 425 Washington St., Somerville, 857-259-6585, www.kirklandtapandtrotter.com. is one of the finest local food trucks, serving up dumplings and Double Awesomes (essentially an egg sandwich on scallion pancakes). A salad of chewy barley with miso-honey dressing, pickled cranberries, scallions, cilantro, and peanut brittle was wonderful, and wonderfully weird, a trippy combination of flavors and textures that, against odds, worked. It made me excited to see what they would produce at their brick-and-mortar restaurant, just opened in the Fenway. The restaurant is at 506 Park Drive, Boston, 857-250-4959. To find the truck, go to www.meimeiboston.com. Italian restaurant Nebo relocated from the edge of the North End to the center of the city, right on the Greenway. Pasta, pizza, and other classics are here. 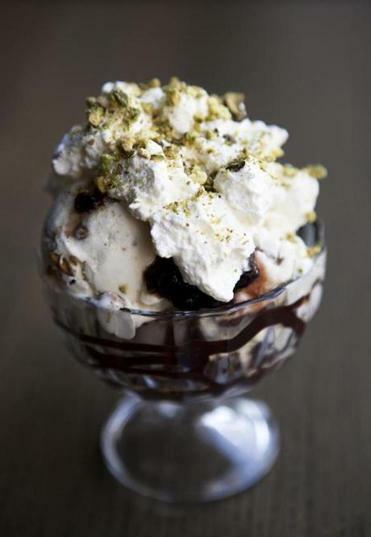 More unexpected is an ice cream sundae (pictured), reinvented with an Italian accent: pistachio and vanilla gelato, espresso-spiked fudge, dark, syrupy cherries, billows of whipped cream, and a sprinkle of pistachios. It’s just grown-up enough. 520 Atlantic Ave., Boston, 617-723-6326. www.neborestaurant.com. One of my favorite restaurants this year was North, located in Providence and worth the drive. Dishes mess with expectations, slicing apart and recombining Asian and other flavors with boldness, humor, and intelligence. For example, the green chow mein ver2.0 (pictured) — fried noodles piled high, tossed with a pesto of almonds and cilantro, tangled together with coconut, garlic, holy basil, and mint. 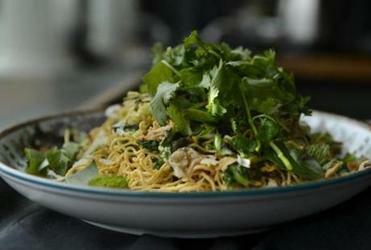 It merges the comforting qualities of standard-issue chow mein with the freshness of a Southeast Asian salad. 3 Luongo Memorial Square, Providence, 401-421-1100, www.foodbynorth.com. Chef Tim Maslow, formerly of New York’s Momofuku restaurants, turned his father’s Watertown sandwich shop, Strip-T’s, into an unlikely foodie destination. This year he opened his own joint, Ribelle, on a corner in Brookline formerly occupied by an Indian bistro. The name means “rebel” in Italian, and the food here certainly breaks the mold. One standout is the lamb tartare, a composition of mild raw meat, egg, sunflower seeds and sprouts, crisped pieces of mint, radishes, and sunchokes. It’s a completely addictive combination of tastes and textures. 1665 Beacon St., Washington Square, Brookline, 617-232-2322, www.ribellebkline.com.